This simple yet delicious chicken recipe can be consumed in different ways. You can either prepare the flavored version to relish with a glass of red wine. Or, you can use it with sandwiches, tacos, and salads. It's quite different from the grilled or roasted version of the same which is generally prepared with hot seasoning ingredients. If you're making poached chicken for the first time, use boneless chicken breast. 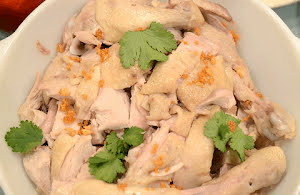 I've used whole skin-on chicken including bones for making the following recipe. Make sure to reduce the cooking time if you're opting for boneless meat. You can freely experiment with the flavoring as per your preferences. Let's make this unique and mouth-watering chicken recipe, right now. Try this easy-to-make and flavorful poached chicken recipe which can be prepared in a quick time with few ingredients to please your craving taste buds. Take a large sauce pan with a heavy base. Arrange all the chopped chicken pieces on the base. Pour white wine on top. Add crushed peppercorns, smashed garlic, lemon slices, thyme sprigs and salt. Add enough water to keep the water level about 1" above the chicken pieces. Bring the water to boil on a medium flame. Now switch the flame to low and cover the pan with a lid. Simmer for about 18 to 20 minutes. Arrange all the poached chicken pieces in a serving plate. Garnish with grated carrot and coriander leaves.